MCCC members went out on our first field trip of the season to Chester. Read on to find out how we managed with a slow workflow and low ambient light conditions. Folks, this time of year is really exciting from a photographer’s point of view. Flora and fauna are blossoming all around us as spring edges its way into 2019. Our club season might be coming to an end but the changing season should be rousing our photography passion in readiness for good weather and lots of opportunities to take and make great photography whatever your genre is. MCCC fed our ravenous appetite for all thing’s photography with a field trip to Chester. Due to the time of the evening, it was always going to be a night shoot and that required a certain discipline from us as photographers. The discrete ‘run and gun’ opportunistic street photography of what I am more akin too has no place in a town centre night shoot. Patience and to some extent discipline are required attributes if one is going to make the most out of this type of photography. A well-attended and well-dressed group of members all met at the cross and we followed Ray G to our first location. The Groves runs along the River Dee and will be familiar to most members. 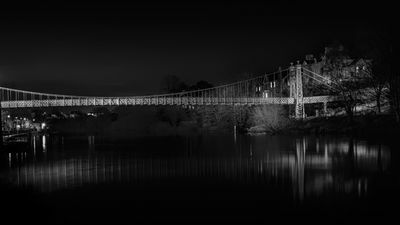 The Queens Park Suspension Bridge, well illuminated and casting a fantastic reflection in the calm waters of the Dee, was our first target. I mentioned earlier about patience and discipline – this comes firstly with the kit. To obtain satisfactory images a tripod is required and using one makes your photography workflow slow. The next thing is being able to focus manually because the contrast detection autofocus systems of a lot of our cameras would not work in such low light. Due to the lack of ambient light, knowledge of the exposure triangle I found was particularly useful, in terms of how a change of shutter speed or ISO affected the other components. Personally, I found success using my live view monitor as it enabled me to use manual settings, obtain pin sharp focus and balance the ambient light to obtain a good exposure. Using shutter speeds of 4 – 30 seconds was the norm so you can see that this type of photography required for me at least, a certain discipline if I wanted to make usable images. The group of members worked really well together sharing ideas and supporting each other throughout the night. Sue Girling made her modelling debut by posing for members on the steps leading up to St John The Baptist Church. After we had finished at the river, we doubled back and hopped onto the Walls making our way to the Eastgate Clock. This was a really interesting exercise as the clock was so bright. 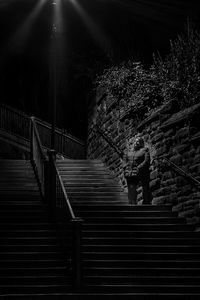 Members faced a choice; do we ‘stop down’ thus reducing the exposure to shoot 1, 2 or 3 stops under or do we take a burst of bracketed shots at different exposure levels with a view of merging them in Post afterwards – decisions, decisions. This was a great location for compositions because in one direction you had the Clock and the other direction was a long view of the Walls which circumnavigated the Cathedral and was a decent composition in its own right. Following on from the clock we moved along the walls to Abbey Square. This is an older part of the City where the Bishop of Chester resides. 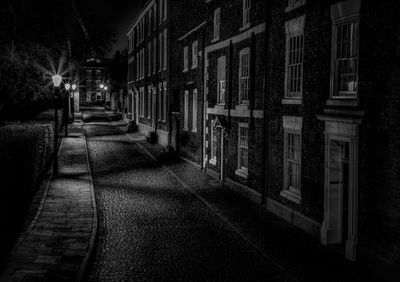 It has a cobbled street and Victorian looking lamps - another great composition to be had which would especially look good in mono. All in all, I had a fantastic night, which was echoed by the members on the evening. I would like to say a very big thank you to Ray Girling for organising the event and to Sue for modelling for us all. I look forward to seeing some of the images taken by the members.